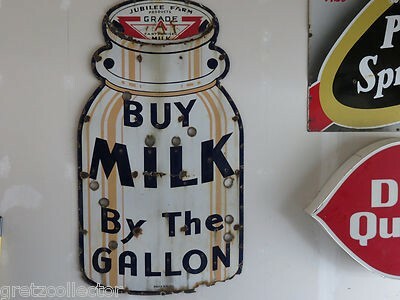 A die cut Milk bottle, this sign is rather large at 72″ by 36″. The sign is for Jubilee Farm Grade A Milk and the text reads “Buy Milk by the Gallon” in large letters. The surface of the sign is white. It appears with the sign shown in the example that there were some versions that were created as neon signs as well.